Niner Nation is gearing up for a spirit-filled Homecoming week, starting Tuesday, Oct. 9. With all the events and programs scheduled, there is something for everyone – students, alumni, faculty and staff. UNC Charlotte’s annual Homecoming football game is set for Saturday, Oct. 13, as the Charlotte 49ers take on the Hilltoppers of Western Kentucky at 3:30 p.m. in Jerry Richardson Stadium. Click here for ticket information. This year’s Homecoming Court comprises 14 UNC Charlotte students who are vying for the title of Homecoming King and Queen. Winners will be announced during halftime at the football game, based on the results of the student body vote. Meet the Homecoming Royal Court members in the Popp Martin Student Union Wednesday, Oct. 10, and Thursday, Oct. 11, from 11 a.m. to 2:30 p.m. Sponsored by the Homecoming Committee, the UNC Charlotte Alumni Association and the Campus Activities Board (CAB), Homecoming events are scheduled for Tuesday, Oct. 9, through Sunday, Oct. 14, and are listed below. Note that tickets are required for some events. Start Homecoming Week with a fun-filled night of music, games, giveaways and school spirit. The Homecoming T-shirt will be revealed. Green Out with SoVi - SoVi Dining Hall, 11 a.m. to 1:30 p.m.
Tailgate with UNC Charlotte student-athletes. Homecoming Comedy Show with Hannibal Burres – Popp Martin Student Union, 7 p.m.
Burres is a popular comedian, writer, podcast host and actor who is a favorite of fans and critics on big and small screens alike. UNC Charlotte students can claim free tickets at the Student Activity Center Box Office. Flag Football Tournament - Jerry Richardson Stadium, 8 p.m. to 1 a.m.
Come out and show 49er pride at this single elimination co-ed recreational flag football tournament. Excellence in Leadership Awards - Harris Alumni Center at Johnson Glen, 11:30 a.m. to 1 p.m. The eighth annual Excellence in Leadership Awards, sponsored by the Black Alumni Chapter, will be presented. The awards recognize the accomplishments of UNC Charlotte alumni and friends who have achieved "excellence" in the areas of education, entrepreneurship, financial services, health care, philanthropy, public service and STEM. Tickets are $20 per person. This year’s recipients include: Emma Allen ’84, Tesha Boyd ’91, Keith Cradle ’07, Robert Rowell ’81, Rondell Richardson ’99 and Tiffani Teachey ’03, ’05. Niner Nation Block Party - Star Quad, 6 to 9 p.m. The Homecoming Block Party kick offs the weekend with fun, food, and community. Enjoy a live band, food trucks and entertainment on the Star Quad next to Atkins Library. Beer and wine will be available for individuals 21 and older. Top 10 Under Ten Awards Dinner - University Hilton, 6:30 to 9 p.m.
Join the historically African-American fraternities and sororities at the annual Homecoming Stroll Competition. Watch these groups give their all in representing their organizations through strolling and dance. Tickets are $13 and must be purchased in advance. Alumni Tailgate + Oktoberfest - Hauser Alumni Pavilion, 12:30 to 3 p.m.
Join the UNC Charlotte Alumni Association before the annual Homecoming game for a remarkable tailgate experience; the annual Oktoberfest will be part of Alumni Tailgate Village again this year. Pre-Game Student Tailgate - Tailgate Village, 1 to 3 p.m.
Join friends for free food and a live DJ before heading into the game. This is an alcohol-free zone. 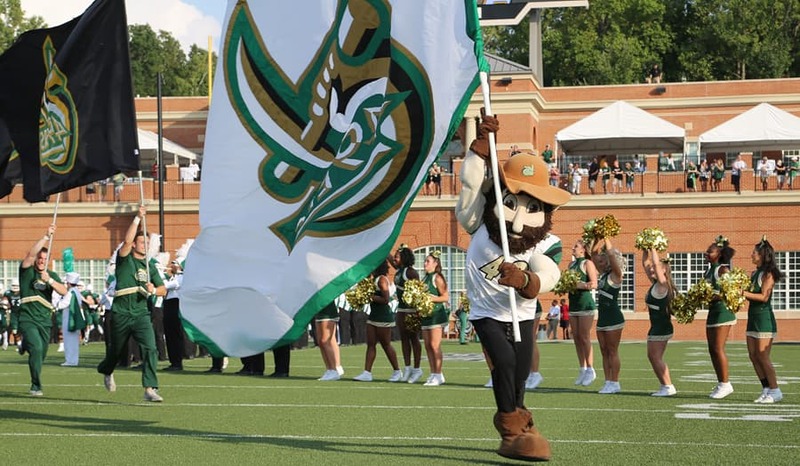 Charlotte 49ers vs. Western Kentucky Hilltoppers - Jerry Richardson Stadium, 3:30 p.m. Cheer on the 49ers at this year’s Homecoming game. Voices of Eden Reunion Concert - Cone Center, McKnight Hall, 3 p.m. The Voices of Eden Gospel Choir was founded in 2005 to inspire and uplift the campus community and beyond through the gift of music. This first-ever reunion concert will bring back Voices of Eden alumni from the last 13 years, along with current members, for one big collaborative event. Tickets are $20. More information is online at homecoming.uncc.edu.